During the second half of the twentieth century the harpsichord made the remarkable transition from almost extinct historical curiosity to concert hall staple not just for early music but also for new music from composers including John Cage, Elliott Carter and Maurice Ohana. Wolfgang Zuckermann's $150 harpsichord kits, which were launched in 1959, were a major factor in the rehabilitation of the harpsichord, and Zuckermann supplied instruments to John Cage and many other musicians from his workshop in Greenwich Village, New York. The legendary 'Model T' harpsichord kit is Wolfgang Zuckermann's best known contribution to music history. But he had been making high quality finished instruments for a decade before entering the self-assembly market and his manufacturing business continues today under different ownership. In 1969 he published his influential book The Modern Harpsichord which advocated a return to authentic specifications for contemporary instruments and rejected the 'romantic' approach pioneered by Landa Landowska and her Pleyel instruments. Wolfgang Joachim Zuckermann was born in Berlin in 1922 and became an American citizen in 1938. He saw action in the Second Wold War in the American army, but in 1969 he sold his harpsichord business and left America because of his oppostion to the war in Vietnam. After a period in England he settled in France where he developed a successful second career as a social activist, early environmentalist and author. He has been active in drawing attention to the environmental impact of the internal combustion engine and was one of the team who created Buy Nothing Day, an international day of protest against consumerism. 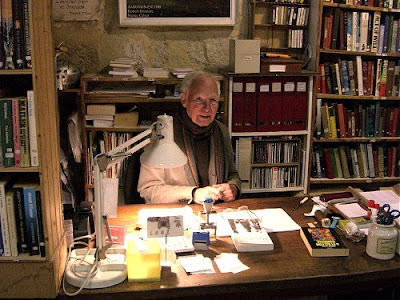 As well as continuing his environmental and social activism Wolfgang Zuckermann founded the Librairie Shakespeare in the university district of Avignon, France in 1994. Today, at 87, he continues to run his English language bookstore virtually single-handed. Whenever I am in Avignon my first port of call is the Librairie Shakespeare; I took the two photos seen here two weeks ago after buying, for less than the price of a beer in a trendy Avignon bar, a rare copy of Samdhong Rinpoche's lectures published by the Theosophical Publishing House in Madras . There is no evidence at all of Wolfgang Zuckermann's pre-1969 life in his gem of a bookstore, and when I asked him if I could take his photo for An Overgrown Path readers he said in his usual modesy way 'If you must'. 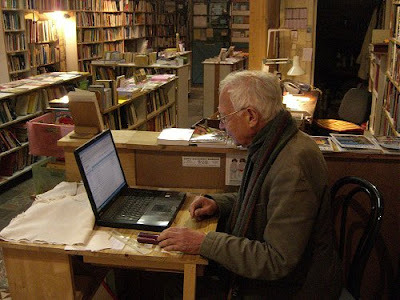 An excellent Wikipedia biography of Wolfgang Zuckermann describes Librairie Shakespeare as 'a bookstore and arts center in Avignon which resolutely refuses the separation of "culture" from the issues of technology, society and personal responsibility'. As we try to find substance in the outcome of the Copenhagen climate summit and read article after article lauding the transitory cultural 'icons' of the first decade of the twenty first century it gives me much pleasure to write this small tribute to someone who, well into his eighth decade, still refuses to separate "culture" from the issues of technology, society and personal responsibility. * Many Overgrown Paths have started with books bought over the years in Wolfgang Zuckermann's store. Just follow these links to explore some of them - Vision de ''Amen, Karlheinz Stockhausen - part of a dream, A hero's life overshadowed, and Words on twentieth century music. "If you must." I adore this celebration of somebody who resists exactly that.